I noticed that some awesome artists I really admire (Evan "Doc" Shaner, Dean Trippe and Mike Maihack) updated their tumblrs/websites recently with a look back at some of the art they produced on 2011. 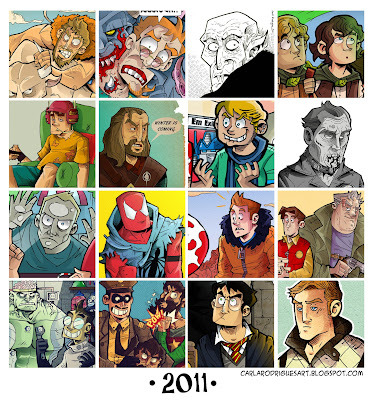 It's an awesome idea, so here's a little montage with some of the pieces I did on 2011. Enjoy! Oh god, Carla. You're so motivated. I could never do a visual summary of a year like this (and there wouldn't be much to show!). Very cool blog though. It's always good to see the WIP and what the artist has been up to.